I am sorry I have not blogged in SUCH a long time I keep planning on it then forgetting or having to set my alarm clock and then having to go to sleep! Or I have to do my homework and that is very hard sometimes and sometimes VERY easy! I am very excited to finally be able to blog I have been wanting to blog FOREVER. Today's storm was like storm of the century I am watching the news right now and it says that Sherman Oaks and that is near my piano teacher's home. I am very scared because on Saturday we might have a flash flood on Foothill Boulevard I am living on Foothill but I am more downhill so I am pretty safe but I just heard that you are having a wicked storm that is so bad. I hope you are OK. I have been having a rough year so far because I do not like rain at all. I hope you comment back! How wonderful to hear from you! We were just looking at the class picture and talking about how much we wish you were still in our class. I want to direct your storm comment to our new post called Rain and Wind. On this post, Nolan and Elie are looking for people to write an ending for their story. They wrote this gingerbread story, complete with dialogue and elaboration, and readers are invited to complete the story. I remember what a fabulous writer you were. 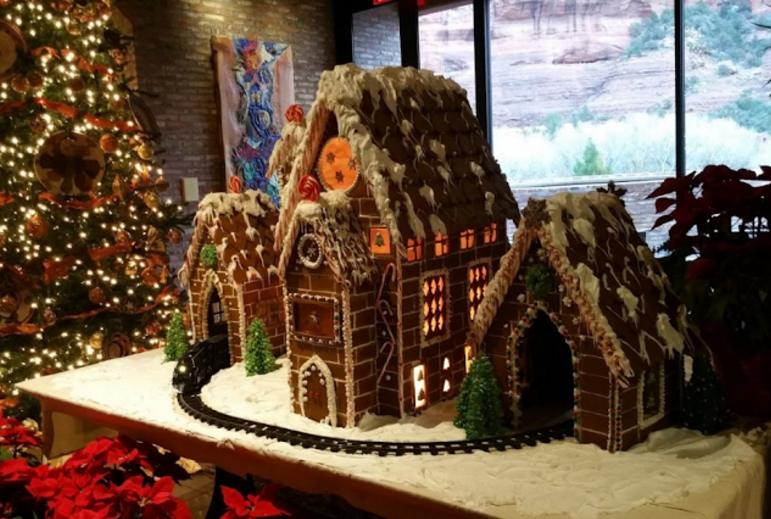 We'd love to hear your ending to this gingerbread tale! Kudos to both of you for writing such an entertaining story and leaving the ending open for others to use their creativity to add to it. Your dialogue made the story very engaging and realistic! The gingerbread house had melted! All that was left was a puddle of schmushy gingerbread and melted frosting with candies floating on top. What could possibly have gone wrong during the night? Nolan and Elie had used their favorite, award winning recipe complete with their secret ingredient just as they had for other contests. What in the world happened this time? Then Nolan noticed something else very strange in the refrigerator. Actually, the whole house had lost power but no one knew because it was already dark and everyone was sleeping. An unusually strong rain storm had passed through the area during the night with winds strong enough to knock down power lines. Well, that explained the problem but now the boys had to think fast and make a new plan. The boys divided up the tasks and worked quickly to remake their creation with the secret ingredient just in time to get it to the competition. Whew! That was close! Here is my ending for the story. When Nolan and Ellie open the fridge they realize they forgot to put candy on top and the gingerbread house looked very plain! Then Nolan and Elie decide to rebake the gingerbread house! While they are baking Elie says it does not matter we are still great bakers. They head over to the competition and get their gingerbread examined by the judges, they were the last ones to be examined so the judges say the winners are... Elie and Nolan!!! Elie and Nolan do a great big hug and high five each other they are so happy! Thank you for an invitation to write an ending to this story. Im actually going to use the idea and give this challenge to some of my students tomorrow in the classroom and see what they can come up with. In the meantime, here I go. Nolan and Ellie were devastated the house was destroyed. Someone... something had eaten the gingerbread house and left it a huge mess. Who was responsible? Who had committed this terrible deed? They desperately searched for clues that would resolve this case... they felt in despair at not being able to put something forward to the competition... they were searching for an answer and looking. The refrigerator was empty! Nolan looked at Elie. Elie looked at Nolan. “Where’s the house?” they mumbled in unison. “There must be clues,” Nolan stated. “Yes. Let’s think like detectives!” Elie suggested. They combed every inch of the refrigerator. They even got a magnifying glass and discovered something interesting. Footprints! They faithfully followed the frosting footprints. The pair quickly identified the prints as bird footprints. Tracks showing three front toes could easily be identified in the frosting, and the decisive duo had their first clue. “Three toes forward...are you thinking what I’m thinking?” Elie queried. The dynamic duo followed the trail. Footprint by footprint, the detectives finally arrived at the neighborhood school. Next to the office was a large WELCOME banner flying high over the gingerbread house. As the boys crept closer, they could see inside the gingerbread mansion. Startled, the inhabitants came to the front door. Foxy Jack smiled and looked at the hotel. Sniff...sniff...sniff. “Your hotel smells delicious!” he declared as he chewed up the front door. “Uh oh, we’re going to be needing more buildings!” Elie declared. “Let’s get baking! Lou the Koala will be coming later this year, maybe she’d like more of a Chumash ap dwelling. You know, the kind of hut that the local Native Americans used to live in,” Nolan remarked. Soon Elie and Nolan had a full-time business making edible homes. Wow! That is a pretty creative story ending you are very good at making up endings. I think your story ending is very interesting. I like how you made me want to keep reading! I hope you continue to be as creative as you are now. This is really what happened to the gingerbread house. Here is a reminder on the last few events, it was the day of the contest. Elie and Nolan opened the refrigerator and saw that there was no gingerbread house. Elie and Nolan were mad, more than mad, they were furious. So, they got to work. They baked and baked all day. They rolled the rolling pin and put on jelly beans. Finally, the gingerbread house was finished. They called an Uber and hopped inside, drove toward Peach Street, and looked for Marcus Hall. There it was, the beautiful fountains, the kid painted murals, and a sign that read, Annual Marcus Hall Gingerbread Baking Contest. They thanked and tipped the driver and walked into the building. Elie looked at his watch and hissed to Nolan, “Were late.” Everybody was staring at them with a weird look in there eye. Nolan took the gingerbread house from Elie and dropped it off at the judges’ table. They were just in time. How would you like to win a gingerbread baking contest? How would you feel? What would you buy with your $100 gift card? We miss you so much! We are glad you wrote your own ending. When Elie and Nolan got up and went to the refrigerator, they saw a pile of letters on the kitchen island. The letters had no return address and they had no names on them. They decided to open one up. When they did, they threw the envelope out. “We have to do something!” Nolan exclaimed. “Do you remember when we had a lot of gingerbread left?” Elie asked, waiting for Nolan’s answer. With that, they went to get the extra gingerbread. Sure enough, the gingerbread was very fresh because they had baked it just yesterday. They built the gingerbread house carefully with the frosting they had left, and soon enough, it was done. Again, they got a ride from Nolan’s mom to Marcus Hall and they went in carefully holding the house. Then inside they put it on the table and waited for the judges to come around. They were scared. They did their best, but they knew it wasn’t winning material. The chief judge came onstage. Suddenly the room went quiet. Mr. Bob looked like he loved Christmas! He was wearing red an ugly sweater with a gingerbread man on it. He had a full black goatee, and he was wearing purple sweat pants! I love your ending it's so so creative I like how you described everything even the judge! The crayons part is that from The Day The Crayons quit? I think you are a very creative kid. I am a pre-service teacher from Brandon, Manitoba, Canada. I have been scouring the blogosphere for classroom blogs to see how teachers are using them for their classrooms. I gotta say, I really enjoy reading some of the things you and your class have posted here, especially this story! The refrigerator door had opened to the gingerbread world! Inside was a a ginger family eating a delicious sugary breakfest. Mr.Ginger looked over at them and waved politely with a smile meant for welcome guests. Nolan and Elie slammed the door in disbelief, looked at each other, and slowly opened the door just enough to peek inside. "Are they still there?" Elie said excitedly. "Well, I know who's winning the prize this year...." Elie remarked. They quickly taped the door closed and loaded the fridge on Nolan's skateboard. A few minutes later they were at the Annual Marcus Hall Gingerbread Baking Competition. All the contestants, judges, and spectators were amazed at what they were seeing! Not only did Nolan and Elie win the competition with their life sized gingerbread house complete with living Ginger people, but they won a Nobel prize for discovering a a gateway to the ginger dimension! I like your story and I hope you try to create more story's. I think this is a fun activity to do as a class when you sit in a circle and you start an ending and you go around the circle and at the end you have a interesting story ending. I hope you are having fun in class because I have a very exciting event coming up this Friday and next Friday this Friday I am having a playdate with my new BFF and next Friday I am doing a Friday Flag Ceremony and the subject is planets. I hope you comment back soon! The refrigerator was black with nothing in it. “I don’t know!” answered Nolan. The boys were determined to win, but how will they if have no gingerbread house? “This is bad. If we don’t enter our gingerbread house by 2:00, we will be disqualified!” explained Elie. “Who could of done this?” wondered Nolan. “Sandy the snake!” Elie cried. “She must of gotten a ride from Buck and stole the gingerbread house!” Nolan said. The two boys ran around the house looking for Sandy. Finally, they found her in the living room. Not a word was spoken. “You will figure it out. You guys are geniuses!” Sandy said nicely then turned and slithered away. “Well, I guess we have nothing to enter with,” Elie said disappointedly. “We might as well go to see the other contestants,” Nolan exclaimed. They asked to get a ride from Nolan’s mom. Then hopped in the car and drove to the competition. When the judge said, “And now showing their gingerbread house, Nalono and Elee!” The boys were shocked. “Huh?” they said in unison. Then the judge pulled out their perfectly baked gingerbread house and tasted it. Still shocked, the boys just stared at the judge. The boys were confused, but as told, went up and got medals. The boys were very happy. While reading this, I exclaimed, "Wow!" I am impressed with your excellent use of dialogue and your mastery of grammar and punctuation. Also, I see that "Nolan's mom" makes an appearance in the story, which I found unexpected and exciting! Keep up the great work stretching your brain to always create new, entertaining, realistic and properly written dialogue. I am very proud of you. What do you enjoy most about writing plentiful dialogue? I really enjoyed your gingerbread mansion story. I liked how you told the story. This is my ending to the gingerbread mansion. “Oh no! What happened here?” Nolan said to Elie. “It melted!” Elie started to scream. They read the recipe again. What should they do? Quit or try again?